This pic comes from a cool site that gives details based on where you live. I had never really thought much about eclipses. I know a solar eclipse is when the moon crosses in front of the sun, blocking it out. And I know a lunar eclipse is when the moon enters into the earth's shadow when sun/earth/moon align. And I know you can't look at an eclipse with your bare eyes or you'll go blind or explode or something. But that was the extent of my knowledge. Despite the extremely long length of my post about what I do for a living a couple of weeks ago, I only scratched the surface of how cool my job is. One of the things I left out of that story is about the diverse range of things I get to learn about, from the details of things like call center software to the inner workings of corporate America to the random things you learn about life and the world from interviewing people for profiles, bios and the like. This week, I got to learn about about eclipses and learned a few things. Like there three types of eclipses...total, partial and annular. The US will experience both total and partial eclipses. I didn't think about eclipses, so I guess I thought an eclipse event was either all total or all partial. An eclipse can be as big as the US and Canada, but only people in a very narrow swath of the path get the totality...the total eclipse...a true 100% coverage of the sun. In the case of this eclipse, that path is roughly 70 miles wide and reaches across the country, coast to coast (it's the darkest color in the pic) and the eclipse moves from west to east. Everyone else gets a partial. Eclipse watchers say people in the 90% zone (the second darkest color) will only experience 1/1000th of the spectacle. That's probably an exaggeration, but being inside the path of totality is a big thing. Where I live, we'll see just 81%. So I guess I didn't realize all of that. And I didn't know the air temperature can drop 12 degrees during an eclipse. I also didn't know solar eclipses happen every 18 months..somewhere on earth. There have only been 10 in the US in the past 100 years, many of which were annular. In an annular eclipse, the moon is further from earth and can't totally block out the sun. Instead, it leaves a "ring of fire". The last total eclipse that came near the east coast was 1970 and I remember it clearly. It was a big deal then, too. 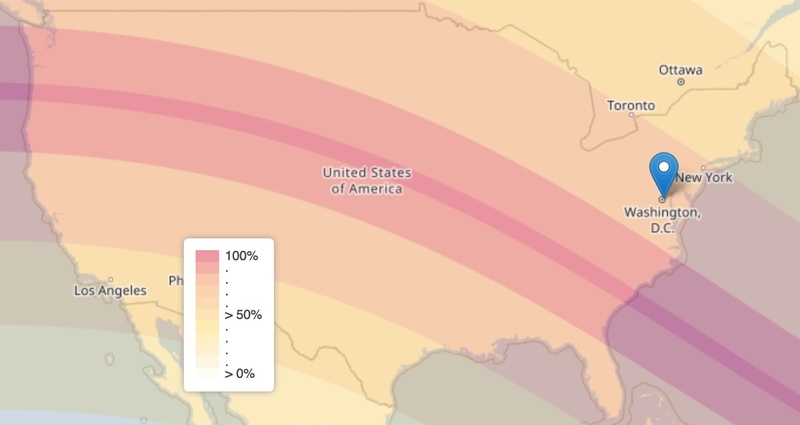 The next US based total eclipse happens in 2024, but this one reaches in a north/south angle along a path that runs from Maine, through the Midwest and down through Texas. That one is not as special because it will miss Alaska. My newfound eclipse knowledge comes because one of my clients is a resort-type destination on the SC coast, right in the path of totality. I mean, what better way is there to see the eclipse than from the white sand beaches of the Atlantic? Sure, it only goes on for three hours with the real show only lasting two minutes, but it's worth the trip. It's once-in-a-lifetime...unless you want to travel to the Midwest in 2024 and watch it over a corn field. Or wait until 2045 or 2078 (assuming we're not all dead from old age and/or climate change). Stuff like this always gets me musing about what ancient man thought about stuff like this. I imagine the first time someone saw it, it was pretty scary. I wonder what they made of it. One of the sites I visited said some guy back in 500 BC determined the earth was round because earth's shadow on the moon during a lunar eclipse was round. (Before him, though, Pythagoras determined the earth was round due to the curves on the waxing and waning moons.) Considering some people on earth still think it's flat, these gentlemen were way ahead of their times. I'm not sure how I feel about this, but there are places and things I'll ever see because I'm just to lazy and procrastinating. One day when/if I move from Washington, DC, there will be sites I never saw...museums I never visited (though, trust me, I've seen a lot.) And I will probably think to myself, "I should have done that when I had the chance." But it won't be full-on regret, because if I had to do it over again, the circumstances that led me to the choice would still be the same and my choice would be the same. It is the way I am, so why waste time on regret? This eclipse is the same way. I'm not going to drive 8 hours to SC to get in that path of totality, like my neighbor is thinking of doing. It's tempting because everything about it is cool. For two minutes. After an 8 hour drive. And the 2024 one is even farther away. So I'm consciously choosing 81%. And I do have plans for that day. I'll be watching with friends. We already have our viewing glasses and everything. I can watch the totality on youtube when I get home. This lifetime is full of things I'll never see, never do and never regret. That doesn't mean I don't think they're magical and awesome. If I were the kind of person with the wanderlust and sense of adventure it takes to show up for things like eclipses or remote waterfalls or daunting mountain peaks, I'd be a different person. Instead, I learn about things and somehow experience them almost as if I were there myself. Indeed, one of my travel clients frequently remarks on how I know their city like I lived there all my life. I've been there in mind (and through a lot of curiosity-driven research,) if not in body. While it would be fun to see the world through the eyes of a physical adventurer for five minutes, I'm sure it would also be exhausting. I did some of that when I was younger and, in retrospect, it was. But mostly, in this lifetime, I'm enjoying the journey through the spiritual and mental landscape, and showing up for the totality of my own inner eclipses. Same side of two different coins, I guess. Like the adventurer, I'm sure, I'm happy I won the coin toss.